Roe Deer Lodge is located on Limefitt Park at Kirkstone 28. This is a modern 2 bedroom self-catering lodge with outside hot tub. Lovely position close to the playing field. Dog friendly - 1 family dog welcome. On arriving Friday PM our hot tub was at 28C, we waited and saw if it would warm up and when it didn't went to the site managers office to ask for help- he was a little confused and said as the lodge was private and not owned by the site he was unable to assist but recommended looking on the internet re the controls. This we did- to no avail, finally ringing the emergency maintenance guy who was very helpful- taking us through some things to try on the control panel before phoning the site manager and instructing him to get an immediate repair to the hot tub ASAP (IE Saturday morning) as it was the responsibility of the site to maintain and make good faults. On Saturday morning the excellent site maintenance guy was very helpful, identified an air lock- cleared it drained half of the tub and refilled with hot water and dechlorinated allowing us to use straight away. He was very helpful as we had two children who were looking forward to using the tub. Walked around Troutbeck and crossed beck by several nice bridges- ran down to Windermere and back on various quiet roads- leisure facility looked nice just 2 miles away but too busy to use it- had a nice drive around with kids and saw some crazy cyclists ascending the valley and not grimacing ! Amazing fortitude. Play area was nice and clean and all items operative- food was very nice in on site pub- children enjoyed it a great deal- water pressure was fantastic for showers ! The area was beautiful and quiet- amazing for running/ walking. What one experience (e.g attraction, walk, day out) would you recommend for our future guests? Walk down to church, cross valley by lane past old vicarage and up to Old Post Office (now excellent tea/coffee shop with GF cakes)- carry on to left and re-cross valley by new footbridges to return to site- 45 mins walk. Thank you for your review, Yasmin and we are sorry to hear there was a problem at the start of your stay. We are keen to address any issue as soon as we are made aware, and as soon as you contacted us about the tub, we chased this up with the Park (responsible for servicing and maintaining this particular tub) and to our understanding the issue was quickly resolved. We can only apologise for the inconvenience caused, although it is pleasing to hear that once working, you made good use of it. A super addition to any lodge. This cosy two-bedroom holiday lodge with hot tub is a delightful place to stay and very relaxing. A beautiful location with amazing scenery. We are delighted you all went on to enjoy your stay at Roe Deer and it will be pleasure to welcome you again in the future. We enjoyed are stay but the lodge needs a bit of work in place. Like the kitchen area doors,oven and fridge door. Also we had a lot of centipedes in the lounge area and kitchen which put me off. And light wasn’t working when you come through the front door. Thank you for your review, Linda. We are pleased to hear you enjoyed your stay at Roe Deer, and please note that we will follow up on the comments raised. The lodges are regularly assessed and checked for any maintenance issues of which are promptly addressed. Thank you for making us aware and we apologise for any inconvenience caused. 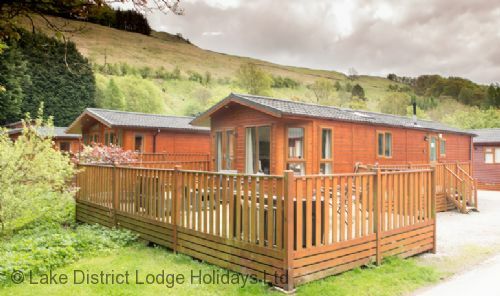 Roe Deer is a modern two bedroom holiday lodge with hot tub. A cosy, well equipped lodge in a stunning location. We will be delighted to welcome you again in the near future. Great stay at the lodge, everything you need for a weeks holiday, only thing the the tv is too small in the lounge for the sake of a few hundred quid could be replaced with a bigger one. We had a great time and would stay again. The site is lovely and peaceful with fab views. The pub on site serves tasty food. The lodge was clean and comfortable. The only moan we had was the hot tub water was a little dirty and the cover was very heavy and tatty and hard to remove! The peace and the lovely scenery. A day at the South Lakes safari zoo. Thanks for writing a review of our recent stay at Roe Deer Lodge, Allison. We apologise that you had a few difficulties with the hot tub lid. This has now been replaced as the old one was damaged (which caused bits and dirt to get into the water). Other than this it sounds like you enjoyed your stay at the lodge and Limefitt Park. Roe Deer Lodge is a very popular and comfortable place to stay especially with it's private use hot tub. We look forward to welcoming you back again in the future. The lodge itself was great. Had everything you would need and was very clean. Check in was quick and easy. The only issue we had was with the hot tub. The water was really dirty, full of dead flies and white bits from the chlorine tablets. We did ring reception and ask them to clean it. They came out to look at it and said they would refill it but didn’t. So we couldn’t use it in the end. Was very disappointing. Thank you for the review, Rebecca and whilst we apologise that there was a problem with the hot tub this particular tub is the responsibility of the park. It is disappointing to hear that the issue was not dealt with at the time and we can only apologise. Having said that we will certainly raise your comments with the lodge owners and also the park management. We would like to think that something similar will not happen in the future as Roe Deer is in a magnificent location for a relaxing break in the Lakes and the lodge itself is beautifully presented. We had a fantastic time in the lodge extremely clean and comfortable. The hot tub made it for our child . Had a brilliant weekend surrounded by some of the best scenery there is , first time for us but probably won't be the last. We were delighted to hear you had a brilliant weekend at Roe Deer Lodge, Keith. Thanks for taking the time to write a review for us and we look forward to welcoming you back for another stay hopefully very soon. Don't forget you will receive a returning guest discount for a future stay! I booked and stayed at this lodge through Lakedistrict holidays. We found the park without difficulty, the setting / location itself is magnificent. Upon arrival to the park we reported to reception where a friendly staff member gave us instructions, directions and general information. The lodge on the whole was well presented (asides from some points raised below) and our experience was enjoyable. The sunken hot tub is a fantastic feature and adds to the enjoyment. The lodge is nicely decorated with a functional kitchen. This was a dog friendly cabin, it was secure with a fence and gate there is ample room for dogs to play around the lodge however, there is also a dog field a couple of minutes walk from the lodge. Windermere town is about a 15 minute drive from the park. Here you have supermarkets the biggest one being Booths, restaurants, coffee shops etc. You can also arrange cruises / boat excursions. When we entered the lodge there was a TP Link router which despite all our efforts we could not connect to. As reception was closed by this time, we left it until the morning after to report it. There was a different staff member who was not at all helpful. He said that the park did not keep passwords and would have to try and contact the lodge owner and to report back later. We done this and he said he tried to call them once and left a message as there was no answer. (He really did not care at all) This meant we had no WiFi for the duration of the stay other than the park hotspots which you are lucky if you get more than one page loaded on. On the booking website, it said all towels are provided for the duration of the stay. However, this is not true, they do indeed provide one bath towel and one hand towel per guest, but they do not provide any for use of the hot tub. In addition to this, considering you're asked to shower before and after every use of the hot tub, and I like I imagine many others shower after coming back from the muddy walks along the lakes, then another for my general daytime shower, that one towel becomes very wet and in need of a change. You are however, only provided with one towel for the duration of your stay. Whilst these may seem like minor points / nitpicking, when a holiday park advertises a 5-star rating, and charges the price of one, you certainly do not expect to find these problems. Upon investigation, I have seen other reviews of a very similar nature from different time periods, so it does seem guest's comments are being ignored. Thank you for your review, Ryan. Firstly our apologies that a few things were not quite to your satisfaction, although you kindly point out the location is magnificent. We have noted your comments and have already responded to you directly with our findings and to clear up any issues that were of a concern to you. It is particularly disappointing that you told us you chose not to read the information we sent to you clarifying everything about your stay as you thought they were confusing (they specifically mentioned the need for guests to bring their own beach/sports towels when using the hot tub). We feel we should clarify a few things for future guests of Roe Deer. All relevant information regarding a guest stay is highlighted during the online booking process, the FAQs section on our website and included in the arrival information that a guest receives before a stay. We will consider whether we can make things any clearer although this is of no use if guests choose not to read or ignore the information. Similarly you also chose not to contact us about some concerns during your stay although seemed to expect the reception team to deal with these matters (even though our information again makes it clear that you were staying in a privately owned lodge arranged through us as the booking agent). We are sorry for any inconvenience this caused. We apologise further that the Park Reception gave you incorrect information and did not refer the issue to ourselves. We will bring this to the attention of the park manager and we would like to believe it was a one off. We are grateful for you informing us of some maintenance issues which we were not aware of and these have all been addressed.Roe Deer does not have it’s own dedicated wifi connection and we are unsure why there was a TP router in the lodge. We think may have been left behind by a recent guest. It is not part of any Wi-Fi set up at the lodge and it has now been removed. We are sorry for any inconvenience this caused. We are aware that the park’s free wifi can be hit and miss (again as we point out) and from our experience it is usually only good for basic surfing and emails. If an internet connection is a necessity for a stay then we would advise guests to stay in another one of our privately owned lodges with its own dedicated internet access. We appreciate you pointing out a few maintenance issues which we unaware of. These have been checked and addressed accordingly. We provided a feedback sheet in the lodge specifically for this purpose although it was not completed as you left. Limefitt Park has a 5 star Visit Britain Holiday Park assessment although that does not mean that lodges on the site have their own 5 star ratings. Roe Deer does not have an independent star rating although we use an average review score based on guest experiences. We take all feedback very seriously and act quickly to respond to any issues or maintenance needed. In addition to passing on concerns and suggestions to lodge owners who are responsible for the facilities and condition of the lodge. Roe Deer is a hugely popular, comfortable lodge with the benefit of a relaxing hot tub offering a great value stay all year round. It is a perfect base when wishing to spend time outdoors enjoying the beauty of Lake District. Thank you for taking time to leave a review, Derri. It is very pleasing to hear that you enjoyed your stay at Roe Deer, it is a super lodge and beautifully presented for guests to simply relax and unwind in comfort. We note your comments regarding the hot tub and we apologise that it appeared not to be as clean as expected although we can assure you the health and safety of our guests is a priority and the hot tub was serviced on the day of your arrival and is maintained to current industry standards by an independent contractor – please note for future stays that should you have any concerns during your stay we can gladly arrange a servicing contractor to check the tub for you. Thank you for letting us know you will be booking again and very kind of you to recommend this lodge to others. Roe Deer offers peace and tranquillity, amazing views as well as comfortable accommodation with a private hot tub. A wonderful holiday retreat. Thank you for your kind comments, Debbie. We were delighted to hear you had a fantastic stay and very pleasing to know that everything was to your satisfaction. Roe Deer is a modern two bedroom lodge with hot tub, beautifully presented and well equipped for guests to relax in comfort. We look forward to you returning in the near future (complete with your loyalty discount!). We visited re deer lodge for my daughters first birthday. Would like to start by saying we had a lovely time and really enjoyed our stay, we did have some issues, the markings on the oven dials had faded so we didn’t have a clue how to turn it on or how to set the temperature, the cupboard door was hanging off and wouldn’t stay shut, the chair in the living room was badly stained and there wasn’t enough hangers. The tv wasnt much either. The kitchen was well equipped and clean when we arrived, hot tub was lots of fun, bathroom was nice and spacious. The lodge was lovely and warm with good heating system. Thank you for your review of Roe Deer. We were pleased to hear you had a really enjoyable stay although we apologise there were a few things not quite to your satisfaction. The oven dial is now clearly marked – thank you for making us aware. The cupboard door is fixed. New hangers have also been put into the lodge and the upholstery chair has been cleaned. Thank you for bringing these to our attention and we are sorry for any inconvenience caused. Had you contacted us during your stay we would have gladly rectified these things for you. With regard to the TV we have passed on your comment to the lodge owners for their reference, although a full description of the lodge is available to view on our website and is encouraged before booking with us. Roe Deer is hugely popular for those looking for a relaxing and peaceful stay in a beautiful location - with the added bonus of a hot tub. A perfect place to unwind and enjoy a little ones birthday - and glad to hear the hot tub was such fun! We are sure that should you choose to stay again you will find everything to your satisfaction. Really enjoyed our stayed, lodge and hit tub were fantastic. Great for having the dog and very comfortable. Will stay again. Our second visit to Roe Deer and enjoyed it as much as the first time, it really is a home from home! Thank you for your kind comments, Ian. We are delighted to hear you had another enjoyable stay at Roe Deer. Modern, cosy and well-equipped accommodation with a hot tub. Very inviting after a walk up Helvellyn! We look forward to you returning for a third visit very soon. Out first visit to Limmfitt Park. Nice site with good facilites. Good location to explore the lakes. Good location. Nice site with good facilities. Great value for money... But just a few improvements needed! To start, the location of our lodge was beautiful, surrounded by lovely views on all sides. On the booking it said there was room for two cars... not really though, so if the two car you're taking are huge, I'd maybe rethink the parking. On arrival the lodge was mostly clean but lost of tiny dead flies on the windowsill in the kitchen. The bedrooms and bathrooms were great, comfortable and very clean! Living area was smart, clean and comfy. Decking area was tidy and hottub nice and clean! I feel that the welcome folder needs updating!! We found other peoples booking information in there and it just looked old and needs an update. The instructions for the hottub aren't great! We assumed it would stay hot unless we changed the settings but when we can to use it on the second day the temperature had dropped down a fair bit and when we called reception we got told that it goes into sleep mode... this isn't in the instructions. The pub on site is great, food is good and the management team are really lovely!! It's a shame though that it can get super busy with not enough staff which resulted in the kitchen being closed for an hour during service time! We were lucky and ordered beforehand but we felt bad for the young families coming in for food and having to wait around with young children. All in all the site is fantastic and staff are very helpful! We had a lovely stay and didn't want to come home! The views and how quiet it was! Very relaxed! There's an escape room around 30 minutes away (driving) it's great fun! Thank you for your review Emma. We were pleased to hear you had an enjoyable stay although we are sorry there were a few things not quite as expected. We will look into the issues raised and if necessary amend and update the information accordingly, as well as passing on your comments about the onsite pub to the park management. We have also passed on your cleaning comments to the housekeepers responsible for the lodge. It is unusual to receive such comments and we are sure it was a one off although please accept our apologies. There are two parking spaces although as you rightly point out two ‘huge’ cars may be a little tricky. We recommend using the additional parking at reception after dropping luggage off at the lodge. Thank you for bringing this to our attention and our apologies for any inconvenience caused. Very kind of you to let us know you went on to have a lovely stay at Roe Deer. Beautiful accommodation, hot tub and amazing views. Perhaps worth a return visit? Beautiful location and beautiful lodge. Also enjoyed the pop up cinema and the lady singing. Gorgeous scenary . The lodge is very nice although could do with the carpets being cleaned. All in all a lovely stay. I stayed here with my husband and 2 young teenage children. The lodge really was home from home, every facility catered for from kitchen utensils to bedding, there wasn't anything that I needed that I couldn't find. The beds were really comfy and having 2 showers to use was a great bonus. There was even books and jigsaws for a rainy day and food and water bowls for the dog. There isn't a washing machine but there is a launderette on site if you really want to do washing on your holiday? There is a under counter fridge and a 3 draw freezer so I could stock up. The decking area is very spacious with outdoor furniture and was enclosed so the dog couldn't get out. This is a lovely lodge with fantastic views all around. The peaceful surroundings and home comforts. Go to the trail behind the Haybarn Inn and turn left, you can walk for miles in beautiful scenery and not have to cross any roads. I arrived with my partner and parents we liked the place. The lodge was clean and tidy the only issue we had was the single bedroom there wasnt a lot of room. And the site itself is short of things to do really. We would recommend to others to go as the lodge is perfect for providing everything and was a chilling holiday. We only used the hot tub once as you feel your on show as the lodge is close to a road. I would recommend a drive out to kendal were you can do a bit of shoppimg. Thank you for your review, Sharon and letting us know the lodge was presented to a high standard for you to enjoy a relaxing holiday. We note your comments about the second bedroom, although as is advertised it is equipped with two narrow single beds and fitted with a wardrobe and drawers for added comfort. The room is purposely designed to maximise the space available and can comfortably sleep two. We apologise that you found it a little on the small side. Limefitt Park is situated in Troutbeck Valley, an idyllic location for those looking for peace and tranquillity; Amazing scenery and walks direct from the lodge - yet at the same time within close proximity to the many popular tourist villages and outdoor activities; Brockhole is an excellent day out for all the family. We were sorry to hear you only chose to use the hot tub the once as it is a super way to relax and unwind. Referring to the ‘road’ that runs near Roe Deer this is a track that leads to a pony trekking area and has little traffic, although we will pass on your comments to the lodge owners for their consideration and we apologise for any inconvenience caused. Very kind of you to recommend Roe Deer to others, thank you. A super find for those looking for cosy, modern and well equipped accommodation with a hot tub. A relaxing retreat in the Lake District. Really enjoyable holiday. The lodge was excellent, well furnished and equipped. Very spacious and comfortable. The hot tub was an added bonus too. Limefitt Park itself is in an idylic location. Ambleside is lovely and definitely worth a visit. Enjoyed our stay. Excellent location, peaceful and easily accessible to main attractions etc. Cabin size good for two but was quite dated, ready for a revamp and taking up a notch or two re decor and colour scheme. Everything on hand that we needed - would recommend a stay on the site any time . Brockhole Visitor centre - excellent day out for all family. Thank you for your review, Ellen and feed back on some aspects of your stay. The colour scheme is neutral and we will pass on your suggestions and comments to improve the lodge to the owners for their consideration. Roe Deer is a very popular, comfortable lodge with the added benefit of it's own private hot tub in which to relax. Beautiful lodge in stunning location. Everthing we needed was included very clean and comfortable and hot tub a bonus. Thank you will definately be back. Thank for leaving such kind comments, Janet. We are always happy to hear guests have had an enjoyable stay. Roe Deer is indeed beautiful, very well designed and equipped and with an extended outside terrace - and a private hot tub this is the perfect place to relax and unwind, very peaceful. Ullswater is a lovely day out for all the family, amazing scenery and the landscape is breathtaking. We very much agree with your title 'heaven', the lodge offers very comfortable modern accommodation and is located in a beautiful part of the world, how much better can it get? Very kind of you to let us know you will be returning and we look forward to welcoming you again in the near future. The lodge had everything we needed the park and staff very nice, could not fault the park or lodge. We tried the pub staff great and food lovely. The lodge was very comfortable and hot tub a bonus will definitely be back to this park very peaceful enjoyed every minute. Excellent stay at the site, very quiet which is what we wanted. Just a minor point but after segregating all my waste and placing in the separate bins I noted the contractors waste collection then mixed it all together. Nothing to do with the site but worthy for them to be aware of this. There was a great selection of books, games, information and DVDs for entertainment in the accommodation. We took a high chair and travel cot but only found them in a cupboard in one of the bedrooms which wasn't well advertised on the website that such equipment was available. These a re minor points and i would recommend this site to others. Thank you for your review, Jonathan and letting us know you had an excellent stay. Roe Deer is a very popular choice for those looking for a peaceful getaway in the Lake District. The lodge boasts beautiful views overlooking the playing fields and open countryside, how better to relax and unwind? We have passed on your comments about the waste collection to the Park Management, thank you. With reference to the lodge having a high chair and travel cot we do include this information in the booking confirmation although we will check to make sure it is clear and if necessary update. Please accept our apologies for any inconvenience caused. We were pleased to hear you enjoyed the peace and tranquillity of the Park and delighted you would recommend the lodge to others, thank you. We stayed in Roe Deer for 3 nights and it was perfect, just what we expected and wanted. Beautiful lodge which was clean and had all the essentials for a stay. Loved the hot tub and we were so lucky with the weather whilst down there. Great location, only a ten minute drive from Bowness which has lots of lovely pubs and restaurants. The park was lovely and quiet with lovely views, it was so nice to go and relax in the hot tub outside and look at the blue sky after a long day of walking. I couldn't fault our stay. It was the first time to the Lake District and Limefitt park and I would return to both in a heartbeat. I only wish I'd booked s fee extra days! Overall a great place to stay, especially if you have a family. The football pitch, children's park, dog walking field, on-site shop and pub are ideal facilities for a family holiday in the Lake District. Booking process and welcome was outstanding - excellent communication throughout. Pleasant experience. Lodge was to a good clean standard but does need some maintenance improvements. - Facilities in Lodge were excellent; well fitted out kitchen with everything you need. - Being a wooden construction and in the Lake District I'm sure it takes a good weathering. However, the top step is very rotten and is on the verge of breaking and causing someone a serious injury. - Just behind the hot tub, one of the fence slats has become rotten and had blown through. Luckily I noticed before my dog and managed to temporarily put it back into place. - Overall the standard of cleanliness was good except for the hot tub. Whilst we did use it, I did wonder when we first sat in it if all the scum on the top was from us (we showered before hand) or whether it just hadn't been cleaned between changeovers!?! - Looked very worn and the stains had given it a 'shabby chic' pattern on what was a lovely beige carpet!! Seriously though, as a dog friendly lodge and one with a hot tub, I would consider laying wooden flooring in the lounge/area. I would definitely return to this holiday park again and are looking at returning over New Year. However, I'd want reassurances all the above maintenance had been completed before returning to Roe Deer Lodge. The walk up the fells and down into Troutbeck was lovely. Thank you for your comprehensive review, Lyndon. We appreciate your comments and feedback following your stay at Roe Deer Lodge. We have addressed your main concerns and passed on your comments to the owners for their consideration. We know they will take these on board to ensure Roe Deer Lodge remains very popular with guests. The hot tub is maintained to strict HSE guidelines by an independent servicing contractor and was checked prior to your arrival. Roe Dee enjoys a lovely spot within Limefitt Park and we look forward to you returning at some point in the future. Thank you for your review, Rebecca. We were very pleased to hear you enjoyed a lovely weekend at Roe Deer. A very popular lodge for its peaceful location and very comfortable accommodation. It is spacious, modern and has an extended outside decking area for relaxing and entertaining – ideal on a glorious sunny day, as indeed is the onsite pub! And as the lodge welcomes our four legged friends it is the perfect holiday for all the family. We are delighted to hear you would like to return and we are sure we can help and advise on the best deal available suited to your budget and requirements. The prices do fluctuate depending on the time of year although one of bookings team will be happy to advise so please do get in touch with us, and of course you receive a returning guests discount! We look forward to welcoming you again for another peaceful weekend. Return visitor. Always have a great stay, perfect for a family holiday in a stunning location ...deer's literally on the doorstep first thing in a morning ! Thank you for the great comments, Matt. We are delighted to hear you had another enjoyable stay at Roe Deer. A lovely lodge that is beautifully maintained and fully equipped to offer guests a very comfortable and relaxing stay – indeed the hot tub is very enjoyable and the perfect way to relax after a day out walking. We look forward to welcoming you again in the near future! Lovely lodge .. dog friendly... ideal location for walks and short drive into Windermere , Ambleside and Bowness. Thank you for your kind words and awarding top marks on all aspects of your stay, Diane. The lodge is perfect for those looking for a peaceful holiday retreat as well as magnificent scenery. With many walks direct from your doorstep it is paradise for walking enthusiasts, and very dog friendly. A delightful lodge that provides guests a home from home with the added bonus of a private hot tub – very relaxing after a walk up the fells! Great break in the lakes. The area and lodge were great. The views in the morning were lovely whilst walking the dog. The staff in the shop were helpful and pleasant. But the shock was the pub on site, how great it was , from the food to the beer and the acceptance of a 2yr old running round. The staff were great there as well. Thank you for your comments, Helen. We were so pleased to hear that you had a great stay and enjoyed everything! Limefitt Park is surrounded by beautiful countryside and is fortunate to have onsite facilities - we were delighted to hear you had an enjoyable experience at the pub. Having small children it is often hard to find the ideal holiday, although Roe Deer is a super choice - modern and comfortable self-catering accommodation and extended gated decking for security. Not forgetting the hot tub – perfect for adults and little ones to enjoy! We look forward to welcoming you again in the near future. The hot tub was amazing, sunken so quite private and soooo relaxing! Our stay at the Roe Deer cabin was superb! The location was idilic and in close proximity to Windermere lake. The cabin was 5* with everything you need inside. The hot tub was great and lots of fun. We haven't been back home long and we are already planning our next stay there. I would well reccomend staying at Roe Deer cabins as you won't be disappointed. Our stay at Roe Deer was great. The location was perfect. The accommodation had absolutely everything we needed. The hot tub was great and we thoroughly enjoyed our stay. The walk behind the parks pub, up the hill was a good uphill walk. Thank you for your review, Lynda. We were delighted to hear you had a great time at Roe Deer Lodge. It is certainly a lovely place to stay complete with it's own private hot tub. We also appreciate your comments about our service and it was our pleasure to arrange your visit to the beautiful Lake District. We look forward to welcoming you back very soon. Thank you for feedback on your stay at Roe deer Lodge. We were sorry to hear you felt the standard of cleaning wasn't as you expected. This is most unusual given all the positive comments and reviews normally received. We have however passed on your comments to the housekeepers and apologise for the inconvenience caused. These issues aside you appear to have had an enjoyable stay. Roe Deer is a very popular, modern lodge enjoying a lovely spot at Limefitt Park complete with it's outside hot tub. The park that Roe Dear lodge is situated in is a beautiful place, the staff are excellent and the facility's are great to. The lodge itself was good but there was ages minor problems that let it down a bit. The Hot Tub had to be refilled every morning we are presuming due to a leak, the seal on the bottom of the shower screen in the main bathroom was split and leaking and also the radiator in the same bathroom was also leaking this was brought to the attention of the company and they assured us it would be fixed after our departure so they did not interrupt our holiday. The only other negative thing I could say it that the lodge could do with a bit more cutlery and utensils. Roe Dear was comfortable clean and in a lovely location and we throughly enjoyed our stay. Thank you for leaving a review, Mark. We are pleased to say all the issues have been resolved since your departure, as promised – Thank you for letting us know and we apologise for the inconvenience it caused you. The hot tub even went on a holiday to get fixed! The lodge is regularly checked to make sure there is a sufficient amount of cutlery and utensils and are replenished when needed, although we have noted your comments and we will check this immediately. We are delighted to hear you went on to have a thoroughly enjoyable stay. A beautiful setting on Limefitt and the lodge has the bonus of an extended decking area to take in the gorgeous views. We would be delighted for you to return in the near future when we are sure you will find everything to your satisfaction. Absolutely beautiful well kept and stocked lodge. It was set in a lovely location. Had everything we needed for a relaxing weekend. The hot tub was great fun. Roe Deer is situated very close to Windermere, and set in a beautiful, easy to access location. Facilities are excellent and highly recommended. Booking was very easy and customer service excellent. Would recommend to any family. Thank you for your kind comments, Paul. The Lakes is a lovely place to escape to and we are delighted to hear you enjoyed your stay at Roe Deer. Close to the play area and with a hot tub to relax in makes it the perfect place to unwind. Very pleased to know you received excellent customer service and found the booking process easy. We look forward to welcoming you again soon. Lovely lodge in a great position on the park, really enjoyed our stay. Comfortable and very clean . Perfect for dog walking and in a good location for walks. Can't wait to book back up again for next year! A lovely cosy log cabin, with everything you need, perfect for doggy walks and getting away from it all. Lovely and clean and perfect hot tub to unwind after a long day of walking. Would definitely recommend to anyone. We love the lakes we have been going back for 20 years to different places always around Bowness. Limefitt park and roe deer lodge was the best one for all of our needs. A nice place for a long weekend break! Lake District Lodge holidays were very helpful when booking as there was a problem with the website. We inadvertently left some clothes they were very helpful in sorting this out too. The staff in Limefitt Park reception were not so helpful I found them a bit sullen, like they didn't want to be there. The Lodge itself whilst small and compact was modern, clean and nicely done with everything we needed. Although I couldn't find extra bin bags! I would consider it great for a weekend break. The beds and sofa were very comfortable and the showers in both bathrooms were very good. The decked area outside was a good size and the hot tub was an added bonus. It was great that it was all fenced off so the dog couldn't escape! The only negatives was some of the lodges were a bit close together, and the dog walking field wasn't great. We enjoyed our trip to Coniston and had a nice walk at Eltewater. This is a beautiful site, very clean and very professionally run. From the moment you arrive, u r given a fob which lets u in and out of the site( need to make a deposit). We was so surprised as we went into the lodge, very spacious, clean and a fantastic view, lovely to have a hot tub. We also was able to bring our dog along , they have a special dog field which was great . A great family holiday even the weather was good. the view in the morning, going in the hot tub, and the comfort of the lodge. There is a walk starting from behind the pub on site, beautiful view from the top. We had a fabulous mid week family break. The Roe Deer lodge was wonderful, clean and welcoming. The hot tub was a bonus and our little dog was allowed at this lodge. Limefitt is one lovely park. And not too far from local amenities. Roe Deer Lodge is exquisite, clean, tidy, comfortable and modern. It has all the comforts to make your stay perfect. The hot tub is a great bonus and to be honest you could literally move in and you would only need to buy food! A great place to stay in great surroundings, I would highly recommend, I just hope you don't book the same dates me and my family need! Recently stayed in roe deer and it was exceptional. Beautiful log cabin with hot tub. The lodge is overall beautiful and very well cared for and made us all feel very serene. The location only a short drive from lake Windermere and that despite the wind was breathtaking. Can not fault this break in any way. Lovely site limefitt and friendly staff at reception. Will definately be staying here again. Very easy to find and access. The property was everything we could have wanted, comfortable furniture and comfortable beds. Extremely clean and well appointed with two bathrooms. The hot tub was a great addition and used every day. Views spectacular from the site and the area down at Troutbeck stream picturesque. All in all a good value for money break and the weather was even perfect too with temps up to 28 degrees. Would definitely re book this lodge again. easy access to the lodge and the quiet of the site. We had a brilliant time staying at roe deer,will definately be booking again in the near future. Brilliant place to take the dog away!! Also pub on site was lovely and welcoming to both us and the dog!! What a fantastic cottage.Everything was nice ,clean and modern.We booked this for the Easter break and as soon as we walked in, we felt a warm feeling,very inviting. We did not expect this lodge to be such a high standard and will definitely go again.There was a slight problem in getting the keys out of the safe but other than that, a perfectly wonderful experience.Come Easter Monday, we were a bit sad to be leaving.This will be a stay to remember. The hot tub was an icing to the cake.Could not get enogh of it.I would definitely recommend this lodge. A good location, good that dogs allowed, lodge kitted out well, had small leak in roof but dealt with promptly. will definitely consider returning if cost/rate attractive. Plenty of short walks if small children in tow. The weekend was made perfect by the loveliness of the log cabin and its location. As we sat in the hot tub at night we were joined (not too closely)! by deer's and even a badger wondered past. The location is close to walks and also a short drive into Windermere. The cabin was clean, cosy and very modern. We were able to take our little dog along who was able to potter about outside as there is a secure fence around the cabin. Hopefully we can visit Roe Deer again very soon. Thank you reviewing your stay at Roe Deer Lodge. It was great to hear you loved your stay there. Sorry that there appeared to be an issue with the shower temperature and thank you for bringing it to our attention. The combi boiler has been checked and is working fine although we will monitor it's performance. We have heard of similar situations at other lodges nearby which may be connected to changes in water pressure following repair work nearby. Roe deer Lodge is certainly a lovely place to enjoy the surroundings especially with it's own relaxing hot tub. Location not ideal as unable to walk to local areas. Clean but dog hairs caused allergies. Privacy required for Hot Tub. No Sky card. Amazing Kitchen facilities/crockery/glassware. Noisy neighbours with 3 barking dogs! Thank you for feedback on your recent stay at Roe Deer Lodge, Tracy. We are sorry to hear a few things weren't quite right for you and thank you for bringing these to our attention. The lodge is cleaned to a very high standard so much so that there is rarely any evidence that dogs have stayed. This has been brought to the housekeepers attention. We don't recommend anyone with similar allergies stays in a lodge which accepts pets. The lodge has a sunken hot tub which the owners believe provides adequate privacy although they will look at additional screening following your comments. The Sky Box is there for additional free view channels as there are a limited number of digital channels in the area and doesn't require a card to use it. Limefitt park is a stunning location and just a few miles from the many attractions. Our stay in roe deer lodge was excellent, the condition of the lodge could not be faulted. The heating already being on at arrival meant the lodge was very welcoming. Facilities were spot on, everything catered for. Thank you for writing a review of your recent stay at Roe Deer Lodge, Mark. We were pleased to hear you found this lovely lodge to be excellent accommodation. It is already proving to be popular with our guests especially with the lovely, relaxing outside hot tub.